DUBAI, UNITED ARAB EMIRATES - The video assistant referee made a decisive debut in the Asian Cup on Thursday, playing a role in Ritsu Doan’s penalty goal in Japan’s 1-0 quarterfinal victory over Vietnam. Groningen winger Doan gave Japan the lead 12 minutes after the break when he converted the first penalty kick decided by VAR in the history of the Asian Cup. The technology is being used for the first time at the tournament, starting from the quarterfinals. 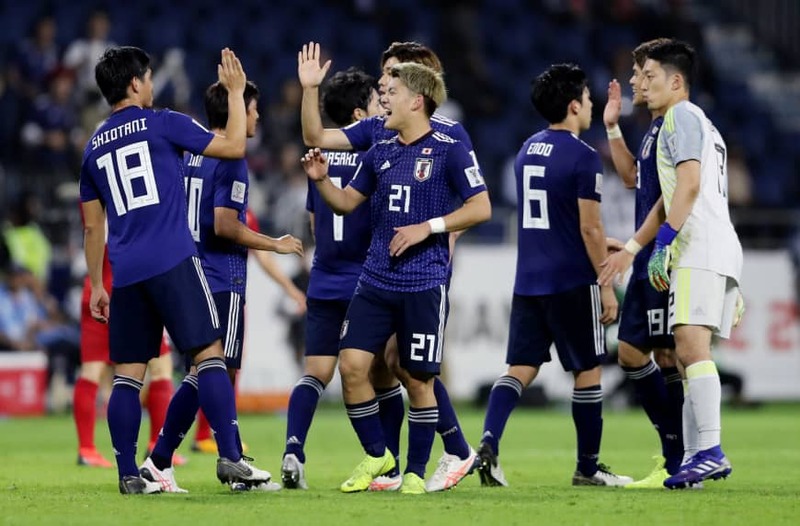 Despite winning all four of its previous matches in the Emirates, Japan came into the clash at Al Maktoum Stadium without having played the free-flowing, attacking football it had displayed in a succession of friendlies prior to the tournament. Four-time champion Japan will continue its bid for an unprecedented fifth Asian Cup title with a semifinal on Monday against Asian Football Confederation-best Iran. Manager Hajime Moriyasu made just one change to the lineup that beat Saudi Arabia 1-0 in the last 16, selecting striker Koya Kitagawa in place of the suspended Yoshinori Muto. First-choice striker Yuya Osako, who has been dealing with a gluteal strain since the start of the tournament, eventually entered as a late substitution for Kitagawa. The Samurai Blue showed their attacking intent early, but initially struggled to contain Park Hang-seo’s young Vietnam squad, which had booked a spot in the last eight by beating Jordan in a penalty shootout. Striker Nguyen Cong Phuong in particular proved a handful, making strong counterattacking runs deep into Japanese territory. Doan was awarded the spot kick after he was brought down by defender Bui Tien Dung just inside the area. Emirati referee Mohammed Abdulla Hassan had initially called play-on but gave the penalty after replays showed the defender tripping Doan, who had been played into the area with a through ball from Gaku Shibasaki. 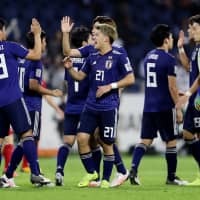 Doan, who debuted under Moriyasu following the World Cup last summer, said the Samurai Blue needed to do a better job of converting their chances in the final third. “We couldn’t score except one goal from a set play. As we move forward we’re going to have to keep putting in the hard work,” Doan said. The VAR was used for the first time in the 24th minute, overturning an apparent headed goal by Japan captain Maya Yoshida. Replays showed the ball deflecting into the net off his arm following a corner kick. “This is a fact from the quarterfinal round. The AFC and the referees were going to make use of (VAR) with all their might,” said Yoshida. Vietnam ‘keeper Dang Van Lam, the hero of the shootout against Jordan, denied Takehiro Tomiyasu from close range in the 37th minute as Japan once again threatened from a corner kick. The 188-cm glove man for Thai club Muangthong United stopped his side going into the halftime break with a deficit when he blocked Takumi Minamino one-on-one in the last minute of regulation. Japan was let off the hook seven minutes from halftime when Yoshida turned over possession with a heavy first touch inside his own area, allowing Nguyen Quang Hai to fire off a shot that was blocked by Shuichi Gonda. Vietnam recovered the ball from the rebound, quickly forcing Gonda to make another save, this time from the head of Phan Van Duc. Japan started the second half on the front foot, creating a succession of chances in the opening minutes. Winger Shibasaki had an attempt blocked inside the area in the seventh minute, while Wataru Endo forced a diving save from Dang with a long-range drive a minute later. Doan won the crucial penalty following a period of sustained pressure. With Japan increasingly dictating play as the half progressed, Vietnam looked to hit on the counter. Its best chance came in the 73rd minute when Nguyen Phong Hong Duy missed just to the right with a shot from outside the box. At the other end, Dang kept his side from going further behind with a number of good saves, including a diving effort in the 77th-minute to again thwart Minamino inside the area. If the Samurai Blue are to lift the winner’s trophy following the final at Abu Dhabi’s Zayed Sports City Stadium next Friday, they will need to step up their performance against tougher opposition, according to Yoshida.